This armchair is one of a group of three that demonstrates a strong Dutch influence on some of the earliest furniture made in Newport, RI. * It also speaks to connections, perhaps less well known, with local Native American craft production. The three chairs are closely related in style, with similar turned rear balusters, slanted arms with incised repeating ball turnings, and front posts with large turned, raised pommels – all features, along with very fine workmanship, that derive from seventeenth-century Dutch chairs that had wide influence in Europe, and subsequently colonial North America (see Kane, et al. 2016, p. 141). Two of the three related chairs have family histories in Little Compton, RI. Unique to the Whitehorne example is the braided cornhusk seat, possibly woven by local Wampanoag or Narragansett weavers. This is an unusual feature found in other early chairs associated with Little Compton, which remained a fairly isolated agricultural outpost into the twentieth century but had early ties through families such as the Browns, who owned this chair, to nearby Aquidneck Island and the urban centers of Portsmouth and Newport, as well as to local Native American craftsmen. 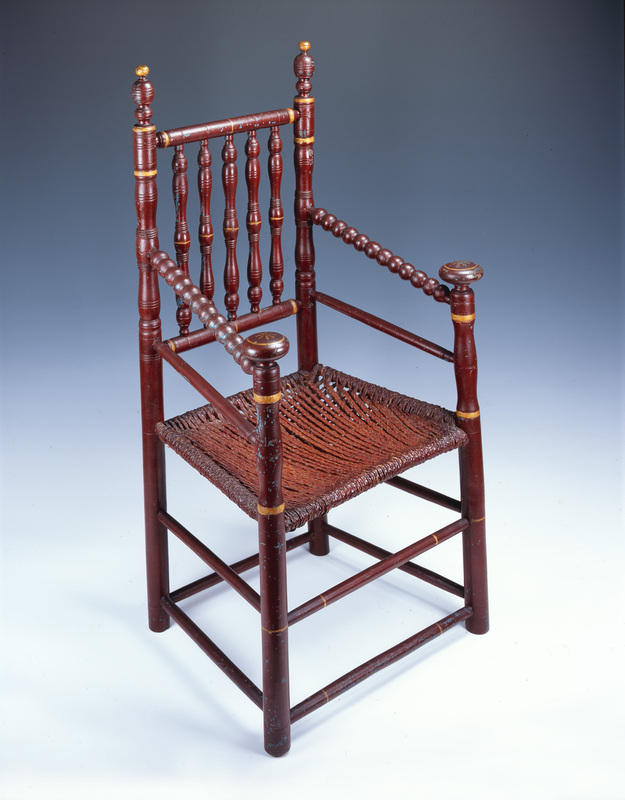 Later in its history, this chair was acquired by Newport attorney and influential collector Cornelius C. Moore (1885-1970), who bequeathed it together with the bulk of his collection of important Colonial Newport furniture and silver to Providence College. The collection was sold in its entirety for the benefit of the college in 1971. Doris Duke, a long-time client of Moore, and whose interest in early Newport and Rhode Island decorative arts was possibly influenced by Moore, was one of the most active buyers at the Parke-Bernet sale. It is possible that Duke saw this piece as representative of what Wallace Nutting had immortalized as high style Pilgrim Furniture and as such would serve as a representative example of this period in the NRF museum – eventually Whitehorne House Museum – for which plans were already well underway in 1971 and for which she had been actively collecting since 1969. The red paint with gold decoration dates to the Victorian period; it covers a layer of blue paint, date unknown, but also not likely original. *The other two chairs are in the Little Compton Historical Society, Little Compton, RI (RIF2291) and the Henry Ford Museum, Dearborn, MI (RIF5046). Patricia E. Kane et al., Art and Industry in Early America: Rhode Island Furniture, 1650–1830, exh. cat. (New Haven, Conn.: Yale University Art Gallery, 2016), 14, 30n20, 141–142, no. 3. Parke-Bernet Galleries, Inc., New York, Important American Furniture: Property from the Estate of the Late Cornelius C. Moore, sale cat. (October 30, 1971), 34, lot 111. The back compound of five turned spindles flanked by ring turned uprights and sausage turned arms. The uprights with mushroom terminals above a braided cornhusk seat, on turned legs joined by box stretchers. The chair's visible paint layers are blue covered in red with gold highlights.